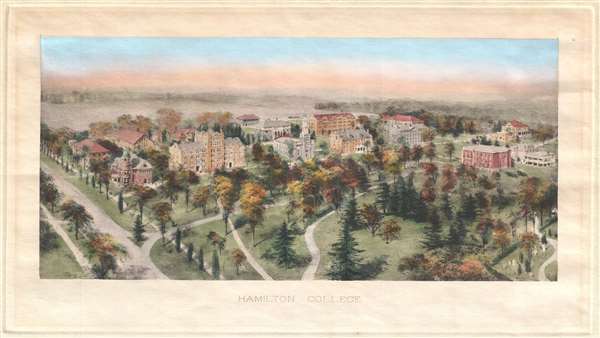 One of the earliest views of Hamilton College. This is an iconic c. 1908 view of the Hamilton College, Clinton, New York, by Richard Rummell. The view focused on the north side, or 'Stryker' part of Hamilton College's campus. It centers on the 1827 federal style Hamilton College Chapel. To the left of the chapel the South Residence hall is clearly recognizable. In the distance Carnegie Hall is evident. At the far left, Couper Hall, with its distinctive copper topped turret is unmistakable. Minor Theater is right center. Hamilton College is a small private liberal arts college based in Clinton New York, in the Mohawk Valley at the foothills of the Adirondack Mountains. It was founded in 1793 and charted as a college in 1829, when it was named for trustee Alexander Hamilton. Rummell began issuing views of American colleges around 1905. Rummell's views come in several different forms including color, as here, and black and white. Like most of Rummell's university views, it is copyrighted by Littig and Company. Very good. Slight mat burn just inset pressmark.